I started this Daily Drill Thread the year after I coached in Salzburg, Austria with the Red Bull organization. It was a unique coaching experience because the owner of Red Bull mandated there had to be coaches from every major hockey nation. They recruited me from coaching the Women's Team at Mount Royal College and I went as a skills coach, assistant for the U20 and pro teams and head coach of the U17. We all worked together. M-W the pro's did skills in the morning and T-Th the U17 team did skills. They all had regular off-ice training which included the skating treadmill once a week and 4 on ice practices and usually two games. It averaged 45 trainings per month. There were two Swedish, one Finnish, Czech, Slovakian, Russian, Austrian, American and the Pierre Page was the head coach and he had a Canadian goalie coach. So I got to see how high level coaches from all over the hockey world ran practices. The official language was english and all but the Czech and Russian coach spoke it well. I have attached a picture of the Red Bull Staff 08-09 season. This wasn't a problem as I have coached many international groups including eight summers with Korean teams from youth to college to pro. No one spoke very good english in these groups. In Guadalara, Mexico I did a week long camp and the kid's only spoke Spanish. In the hockey camp in Vierumaki, Finland I did for three summers the asst. 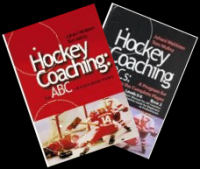 coaches spoke english (they played NHL) and in Hamar, Norway the other coaches spoke it. Most of the players in Austria understood english to varying degrees. I should give a little of my background so you can judge whether the Daily Drill material will be worthwhile. I grew up in Calgary and played Jr. A and then went to Bemidji, Minn. where I played on the varsity team and graduated with a PE degree. I played one year after that in a semi-pro league in Sioux City, Iowa. I came back home, got married and started teaching. I now have a total of three Education degrees. I coached hockey at the school and minor hockey and attended every international coaching cymposium I could and then was called to be an men's asst. college coach. I did this one season and then was head coach for the next three. I got gassed and then was assistant at the U of Calgary for 8 years and in that time coached with 5 coaches who moved onto the NHL; one now is head of Czech Hockey. At the same time I also coached my son's teams during the late 90's and early 2000's. From 2003-2008 I was head coach of the women's team at the college level until I resigned after being offered the position with the Red Bulls. I was only home one week in 7 months and my wife was by herself. It wasn't working very well so I resigned and returned to Calgary. I was asked to coach in the women's pro league WWHL and did that for two seasons until the team ond league folded. I was then asked to coach the U18 female team and I am doing that as of March 30, 2012 and have agreed to coach the next season. This site has ideas from most hockey countries and most drills and games have video examples with many international groups. All the drills and games have diagrams and pdf's with the description, diagram and video link if there is one. Along the way I met Juhani Wahlsten of Finland and we work together and have written a coaching manual which is the official program of Austria (we trained the coaches in Vienna) and a required part of the Finnish coaching program. This site is intended to continually update the material. This is a drill that Vladimir Jursinov used last year in our skills sessions to create flow. He came one week per month to work with the players. I have posted a video of one of his puck handling practices. 1. Pass to the far blue line. 2. Players leave from the far blue line. 3. Skate and protect the puck. 4. Pass 2-5 times in the nzone. 5. Attack in a triangle and a one times shot. Look for the rebound. 6.F3 skate over the blue line to start another rep.
7.Pass from far blue and repeat. 8. Do from both ends. One touch. Make sure the top hand follows the pass and isn't locked against the body. Reijo Routsalainen demonsrtates the proper passing technique. -Rotate the middle player every 10". D joins the play and F backchecks on the whistle to practice offensive and defensive support. There is a 1-1 at one end and on the whistle there is another 1-1 at the far end. The D jumps up to support the attacker and the F must backcheck. It becomes a 2-2. Progress to a 2-1 which becomes a 3-3, a 3-1 or 2-2 which become 4-4 and a 3-2 which becomes a 5-5. This is a great situational drill. This is a contest of forwards vs defense and goalie. The aim of the forwards is to score 15 goals as quickly as possible while the defenders try to make it take as long as they can. Time how long it takes and use this as the mark to beat the next time you play the game. 1. C3 Formation with forwards on one side and D on the other. Have the dark D play vs the light F's. 2. 2 F's attack 2-0 with a max of one pass allowed. You can score on direct reboungs. 3. Coach passes a new puck and they attack 2-1vs a D who has followed the initial 2-0. 4. After the 2-1 a new forward joins the original 2 F's and 2 new D skate to the blueline. 5. After the 2-1 attackthe other coach passes a new puck to the 3 F's who attack 3-2 vs the 2 new D.
6. When the 3-2 is finished the coach passes a puck to F3 in the high slot who shoots while the other forwards screen and tip and the D seal their sticks to the outside. 7. The coach now passes a new puck to F3 who goes the other way on a breakaway. Players really like this game and you create a lot of situations. The coaches can or other players can stand in the places of the breakout team while the coach says where to move the puck. If the coach is alone he can simply point to the area the puck is going. This instruction is to let the players understand the read and react of an aggressive 3 man forcheck. Players line up in 3 lines behind the red line. #1 - on the puck inside to out. #2 - 2 read help #1 if loose puck is created and check D2 on D to D pass. #3 - mirror the puck from the mid slot. Check wing on pass to the boards and mirror D to D from the mid slot. Don't forecheck but mirror the puck from the mid slot until you become #1 or #2. Work on give and go and getting open. Defenders intercept passes and tie up sticks on the rebounds. Play for twenty to thirty seconds and the offense must pass to a joker and get a return pass before scoring. Pass a hard saucer across the ice. Forward time skating so the pass comes when he is going full speed. Forwards and defense are behind diagonal blue lines on each side. 1. Forwards on each side skate and pass to the D in front of them. 2. D's pivot and pass to the forwards on the far side. 4. F get a new puck from the corner and pass to the D then screen the goalie. 5. D skate between the dots and shoot. One touch. Make sure the top hand follows the pass and isn't locked against the body. Demonstrated by Reijo Routsalainen. Defense must skate quickly from the boards to between the dots when they get the puck. Forwards should bounce the puck off the boards when passing to the D in this drill. Alternate sides. Forwards in the corners and defense on the point. You could have everyone practice all positions so that forwards can play the point on pplays and be comfortable while covering the point. 1. Pass from the corner to the point then screen for the shooter who skates to the inside and shoots. Low shots are easier to tip and produce more rebounds. 2. Low players rotate from being the screener to moving across to the wide dot for a shot pass and staying at that dot for a one timer when the puck goes to the original point. All 3 forwards collapse and look for a rebound after the shot. Defensive player first force the play wide and approach the puck carrier from a little behind in a line with the back of the inside shoulder. Create the checking angle and then finish the check with this angle preventing the puck carrier from cutting in or back. *No Penalties and insist on Good Checking Angles. 1. Players line up along the boards in the neutral zone. 2. Coach shoot a puck toward one side near the boards and the players race for it and try to score. 3. The checking player tries to regain the puck and score on the other net. After one scoring chance return to the line up. 4. When the puck is near one goal shoot another puck for the next two players. Start by exchanging the puck and always face the puck when pivoting for the return. 1. Players face each other and regroup in the neutral zone 1-0 then 2-0 and then attack. Start with exchanging the puck and then the breakout pass. 2. On the 2-0 practice chipping by the D to enter the zone or simply enter 2-0 with crosses. 3. You can add defense by having the shooter go out and defend the next attack. 4. When just shooting follow the rebound then circle back for the rebound from the next shooter. Play tight gaps and talk on defense. 1. F1 attack 1-1 vs D1. 2. After a scoring chance and rebound pass to the corner for F2 to join the attack 2 on 1. 3. On whistle pass to F3 who joins F1 and F2 while D2 helps D1. If puck is too far away or in the goal use a new puck. It is a combined man to man and zone defense. Tight man to man on the player with the puck and any player in the slot. Zone defense with the head on a swivel, stick in the passing lane and a Man-You-Puck triangle to stay aware of your man. If someone loses a 1-1 then the support player plays a 2-1 defending the puck carrier and his man. 1. On the 3-3 the players line up at the top of the circle and shoot in any puck that is dumped out or if they can't the coach shoots in another puck for a 30 second shift. Players must communicate all of the time. 2. On the 5-5 the players keep the puck in from outside of the blue line and coach add a new puck if it is fired down the ice. Play 30 second shifts and switch. The players freeze where they are if the coach blows the whistle to give instruction. Make wrist and snap passes. 4. Follow through at the target. A. Two players exchange passes while two players pass and follow the pass. B. Partner pass with 2 groups at once inside the circle. C. Partner pass, One player skate laterally while the other is stationary. Rotate. Could be more than one stationary player. D. Pass and follow the pass in a square. Key Points:Use all of the edges with a good knee bend to change directions. Shoulders lead the turn. The video with the same title is in the skating video section. Skate forward to the middle then slide sideways and shoot. Look up to see the target, shot blockers and team mates in front. On one timers follow through at the target. Increase the speed of the passes. 1. Player pick up a puck and skate between the dots. Pivot so you are facing the net and shoot. 2. Partner pass and shoot 5 one timers then switch. 3. Partners skate to the blueline and give and go finishing with a one timer, then pick up a new puck. Other examples of how to practice one timer shots. Make quick moves and shoot while skating. Sell a fake shot and shoot where the goalie CAME FROM not where he is GOING. 1. Gretzky turn. Force the D to back up then skate laterally back and across. 2. Skate and shoot at the boards while moving. 3. Skate around pylon get pass from 1 and shoot. Repeat with 2. 4. Go around pylons 1-2-3-4 and each time get a diagonal pass and shoot. 5. No shooting angle shoot 5 hole and follow or far post low for a rebound. Players use the moves in a game situation that they just practiced in drills. Encourage the players to be creative and remember that the key to stickhandling is to protect use the body to protect the puck. Sell the fakes to make the defender straighten his/her knees or turn or lunge for the puck and use this instant to go around them and then block their recovery with your body. 1. Use regulation and small nets as well as small tires. In this situation have 4 cross ice games at once, one at each end and two in the neutral zone. This varies with the amount of players. 2. Play 30-40â€ and then switch on the whistle. 3. Variations are possible. Play round robin or kingâ€™s court tournaments. 5. Jokers at the offensive goal line and require a give and go pass before scoring. I took my college women's team to Scandanavia a few years ago. We played in Finland and on New Years sailed across the Baltic from Helsinki to Stockholm. That was quite a trip with 1500 Russian tourists on the ship but a story for another place. Anders Ottossom is a development coach for the Swedish Ice Hockey Federation and he drove about 4 hours to meet us. While there he was asked to run a skills practice for a 13 year old boy's team. I filmed the practice and interviewed Anders after and he explains what he did and why. The Swedes are known for their skill and this practice demonstrates how the combine games for skill with skill drills and transition games with situation drills to created realistice situations. Anders would have used a shootout if he had time, so I added it to the practice template. TC Whiteboard has a practice template that I have posted here and in the files section. It can be used to make practice plans with the explanation and diagram pasted. A coach could save the diagrams I post in this forum and cut and paste the explanations to the template. If you use the search function at the top of the page you can quickly find the drills and games. I will attach a Word and a pdf file of the practice plan. There is a video of the entire practice which starts with Anders explaining the practice. It is in the video section Practices using the ABC method. My college women are doing the warm up to music while the practice is going on. We played an exhibition game after the practice. Skate all directions and pivots. 1. D get a puck from the red line, skate in and shoot, Backwards thru middle lane, get a puck from other side at the red line, skate in and shoot. 2. Lateral figure 8's, facing the coach and exchange passes. 3. Player behind net go from side to side and pass out or walk out for a shot. Goalie read movement. Control the puck and â€œlock and loadâ€ when you carry the puck; meaning move it from in front to your side. Keep a strong skating position with the knees bent and head up. Line up behind the top of the circle with 2 or 3 players facing 2 or 3 players at the other end. Have between 2 and 4 groups depending on the number of players. A group of 4 is the smallest. 1. First player in each line skate towards the other line and pass to the far line. 2. Exchange pucks and pass to opposite line. 3. Skate to red line tight left turn and pass to original line. 4. Repeat but make a tight right turn. 5. Carry toward other player and head and shoulder fakes with legs wide then pass. 6. Alternate knee touches and pass to far line. 7. Carry the puck and do a lateral push to face the other player and exchange pucks. 8. Exchange pucks twice then pass to the far end. *Other passes like backhands, saucer or moves like in the feet, toe drag can be added. There has been a fundamental change in coaching or teaching games. Instead of just doing drills and expecting the players to be able to use the skills and lessons practiced in the drills when they play an official game, both teachers and coaches have realized that they were missing a logical progression in the learning sequence. Now successful practices put skills into game situations so the players are accustomed to performing the skills under pressure on offense or creating pressure on defense. The other logical progression is when a game situation like a 2 on 1 is practiced the coach first does a drill and then he puts the situation into a transition game that mimics the 2 on 1 in a realistic setting where now the attackers not only try to score on a rush but now they complete the play by going for the rebound and battling for a loose puck (instead of going back to the lineup to get out of the way for the next 2-1). The defender must also finish the play and make a pass to the supporting players. Only one puck is used and the action is continuous. There are many transition games in the video section and in the postings I have made in this forum. I encourage coaches to start using the games and transition games to enhance the effectiveness and enjoyment of practices. The pdf gives an introduction to transition games as well as some examples. When the players have learned the basic skills by doing one way drills where offensive or defensive responsibility is repeated but there is no transition, then it is time to practice using the skills in more realistic situations that demand both good technique and game understanding. In transition games the players work on all of the various game situations from the basic 1 on 1 skills to 5 on 6. Quick transition from offense to defense and from defense to offense is emphasized with the theme that; you must always attack so that you can defend and defend so that you can attack.. Transition games allow the coach to create any numerical situation that happens in a hockey game and the players practice the situation under game pressure in the same zone as it would occur in a game. Levels 3 and 4 show transition games where players passively wait in the neutral zone and become active when the puck is passed over the blue line. These games can be used to create power play and penalty situations or to create various numerical situations at each end. In level 5 and 6 transition games the players come into and leave the play according to the game situation so the coach doesnâ€™t have to be continually blowing his/her whistle, but is free to talk to the players as the game is going on. Any of the game formations can be used for transition games. The D200 cross ice games and D600, D700, and D800 small area formations use the same rules as the D100 and D400 transition games that are described below. The link below has a video explanation of transition games. 3 Leave from diagonal corners about 2" apart, skate around circle then shoot, get a pass from the other corner, skate 3 zig zags betweeen the blue line and the top of the cricles the fill the 3 lanes and shoot. 1. Make sure to leave about 2 seconds between shooters so the goalie has time to get set. 2. Follow the shot for a rebound before getting the pass. a, carry the puck with the hands and feet moving all the time. b. carry the puck only using the forehand side of the stick. c. only use the backhand side of the stick. d. transition skate facing the far end forward to backward to forward. Pass hard and face the puck giving a good target. D pivot when they get the regroup pass. This sequence can be done in all situation from a 1-1 to a 3-2. It is probably the most common pro drill I have seen around the world. 1. F1 and F2 leave from both sides and regroup with the far D.
2. D1 pivot and pass to the forward while skating. 3. F1 pass across to the other F2 in the Nzone. 4. Fâ€™s regroup with the D2 at the other blue line. 5. D2 pivot and make a pass to F1. 6. F1 pass across to F2. 7. F's attack 2-1 vs. D1. 8. Players leave from the other blueline and start the sequence again regrouping with D2. D3 join the play at the far blue line. This is a continuous 2-1 transition game using only one puck and no whistles. It practices situations in the nzone, teaches players who to cover in the dzone and how to support the attack. Forwards enter the zone to support the defense and then attack and backcheck. Defense support from the point, defend and then join the attack. Coach can vary the number of F or D to create different situations in each zone. 1. Red F1 and F2 attack 2-1 vs blue D1. 2. Blue F1-F2 support D1, Red D1 support F1 and F2. 4. On Transition Blue F1-F2 attack Red D1. 5. Red F1-F2 Backcheck and Blue D1 join the rush. 6. Blue D2 and Red F3-F4 support when puck enters the zone. 7. Play 4 on 5 and continue flow. It is easiest to start with a 1-1 and progress to other situations but I gave this example to show varying numbers as I posted the 1-1 before. The D like this because they get to join the play and it takes about the same time as a regular shift and they players learn to play in all 3 zones. This video is from a college women's practice. The graphics say passive support but they are playing a continuous 1-1 with active support and the D joining the rush and F backchecking. The diagram is of a contiuous 2-1. I have added a second diagram that shows a 1-1 with passive support. I like the active support better but both serve a purpose. In the passive support you basically have a 1-1 at one end to start and then 2-2 on the attack the other way and a 2-2 in the end and it continues like that. Very similar to the traditional drill where you have a 1-1 at one end and then start a new one at the other with a whistle and the original players leave the puck and the D joins the attack and F back check. It is a drill and not a transition game but isolates situations as well. The defender needs to get within a sticklength of the attacker before the blueline. Attacker should try moves, dekes, fakes, change of pace, shooting beside the D's foot. Both F's and D's should take turns defending and attacking. 1. Attacker and defender both skate from the middle back to their blueline. 2. Attacker turns and goes 1-1 vs defender. 3. Done on both sides of the ice alternating direction. 4. Could do 2-1, 1-2, 2-2. I just sent an email to my Pro Women's Team. We are working on team play and have done dzone, the forecheck, the power play and the next practice we will work on the pk with one short. In the video section there are a lot of specialty team practice examples. here is what I sent. I have attached a pdf about penalty killing. Please read the principles. We will practice the skills or skating in straight lines and always putting the stick on the puck and having sticks in the passing lane. I saw a lot of umbrella and slot set pp against us last year. We want to challenge and fill behind all of the time never giving away a shot from the point or leaving someone alone in front.